Announcement of Cahir O’Doherty’s overthrow. Cahir O’Doherty was the young Irish chieftain of Inishowen, County Donegal who began a rebellion with the English after the other powerful chieftains escaped Ireland in the “Flight of the Earls.” Those chieftains had just lost the Nine Years War and left Ireland to avoid English retribution. Cahir’s rebellion was brief but bloody. In the years after 1200 AD, the rulers of Inishowen came from the O Dochartaigh (O’Doherty) clan. They protected their peninsula with a chain of castles. During Ireland’s Nine Years War with the forces of Queen Elizabeth (1594-1603), the ruler of Inishowen was Sean Og O’Doherty. O’Doherty maintained a friendly relationship with the English during the war, specifically with Henry Dowcra, the English Commander stationed in Derry. 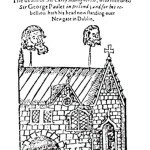 Sean Og died in 1601. His son and heir, Cahir, was only 14 years of age at the time. This was an opportunity for the Irish combatants to install an Irish ally as chieftain of Inishowen. Red Hugh O’Donnell of Donegal had Sean Og’s half-brother Phelim installed as Lord of Inishowen in February 1601. Phelim’s reign over Inishowen was brief. Commander Dowcra and English supporters installed Sean Og’s son, 14 year-old Cahir, as Lord of Inishowen in May of 1601. Cahir’s foster father, Phelim MacDavitt, a loyalist, helped Cahir in making decisions. Red Hugh didn’t care for this situation and attacked Inishowen at Pollen Bay, but he lost in a bloody battle. Cahir’s support of the English gave him the name “The Queen’s O’Doherty.” When the war was over in 1603, Sir Cahir O’Doherty was knighted by Lord Mountjoy. The Irish Earls departed Ireland in 1607. Cahir was foreman of the jury in Lifford who declared the Earls guilty of treason. The Earls’ lands were confiscated by the English, but most of Cahir’s were not. This created hard feelings with some of the English, who believed that Cahir should have lost more of his land and power. Also, there were rumours of a conspiracy that Cahir was planning to retake Ireland with help from the Spanish. His principal detractor was George Paulet who succeeded Henry Dowcra as Governor of Derry. In one occasion, they argued and Paulet slapped or punched Cahir. Young Cahir quickly became tired of the hostility from Paulet and the English, and he went to Dublin to plead his case. He was surprised to find that he was arrested there and imprisoned for a number of days in Dublin Castle. He was released after posting a sizable bail. After all these insults, young Cahir organized a rebellion in 1608 with the help of his foster-father, who was no longer a loyalist. This rash action was probably the result of his anger with his former friendly English allies, and with the confiscation of Irish land which was granted to English settlers. He and his followers captured and burned the cities of Derry and Strabane. His hated antagonizer, Governor Paulet, was killed in the battle of Derry. He then captured Doe Castle in Donegal from the English. Cahir’s rebellion was short-lived. He was killed near Doon Rock in Kilmacrenan just three months after the rebellion started. He was only in his 20s when he died. 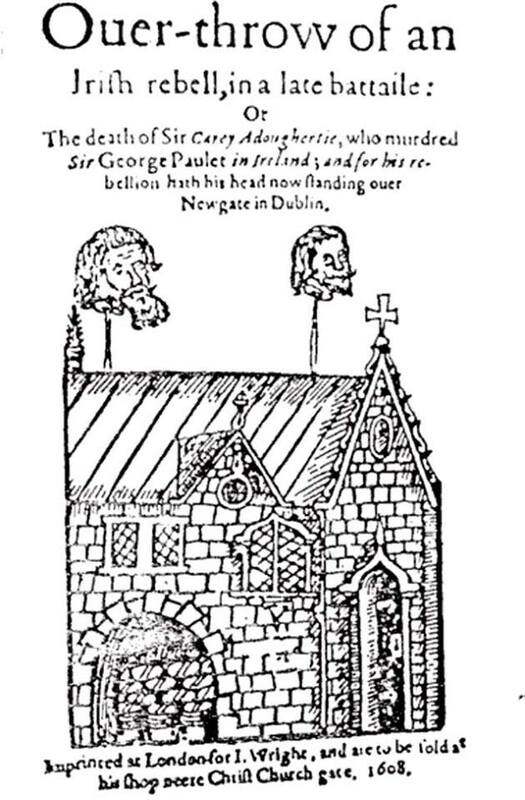 His head was sent to Dublin and displayed at Newgate. In the 1930s, the Irish Folklore Commission (Irish Free State) began a program to preserve the stories and oral traditions of the people of Ireland. It did so by collecting the reminiscences of the “old folks” by the students of its primary schools. The students wrote the recollections of parent, grandparents, and neighbours in their exercise books, under the supervision of their teacher. These handwritten reports are available at the website www.duchas.ie . Donaghmore Parish in County Donegal is the parish of my Gallen and Gallagher ancestors. It is principal locale used in my novel, “Donegal Generations.” In my obsession with the history of the parish, I published several posts about Donaghmore here in my website at: www.tomgallen.com . My last post was about the reports written by students of Donaghmore’s Meenreagh Primary School in the late 1930s that were included in the School Collection of the National Folklore Commission. In this post, I am publishing a few of the stories collected at the Lismullyduff Primary School. I’ll continue sometime in the future with posts from other schools of the parish. Once upon a time there was a woman living in the Glen , and she always kept a barrel of oat meal for her own use. One day when the barrel was half way finished there came an old woman in, and asked her for a bowl of meal and she told her that if she would not tell her husband about it the barrel would always be half full. Time went on and still the meal was not finished so at last the man began to ask about it and the woman had to tell him all about it. The next time she went to the barrel it was half full of horse manure The woman’s name was Floyd. Once upon a time a man had a hump and he was out herding one day. While he was herding he heard a voice and it said; “Monday, Tuesday” The man said; “why not say Wednesday” Then the voice said; “Monday, Tuesday, Wednesday” and the hump was taken off him. Another man had a hump and he was out herding one day. He heard a voice and it said; “Monday Tuesday Wednesday” and he said; “why not say Thursday” Then the voice said “Monday Tuesday Wednesday Thursday” and the two humps were put on him. Tobar Abhog is considered a holy well, it is blessed by the holy Fathers at every Mission, and there was Mass said beside it in the Penal days. It is situated in Lismulladuff, and if you would leave a medal, or beads, or even a little white stone at it and drink some of the water it would cure the toothache or anything of that kind. The water cannot be boiled. Someone took water from it to the bog one time, and put it on the fire to boil but dried up in a minute. The water is cold in summer and warm in winter. There was a girl took ill at it one time and three drops of the water cured her. Her name was Brighid and the well was named after her. About sixty years ago a chalice was found between Donegal and Clar[?] at the time they were making the Donegal Railway line. The name of the boy was John Mac Menamin and he was going with his father’s dinner who was working on the railway when he found it. A Celtic cross was erected where it was found. It was found at the bottom of a ravine at Sessiaghoneill where it was supposed that mass was said during the Penal times. Once upon a time there lived in Gortichar a family named Mac Goldricks. One day they were washing clothes and they left them out on the hedge to dry. About nine o’clock the mother sent one of her daughters out to bring in the clothes but she did not return. The people in the house got anxious about her so they sent out another daughter and she did not return and they searched until morning but never got them. Fairies were supposed to have taken them. Donal Slevin lived in Sallywood and he is dead about sixteen years. He was about seventy five years of age when he died and he was supposed to be the strongest man ever lived in this district. On one occasion he went to the bog for a load of turf and when he was coming down at MacLaughlins of Gortichar the wheel broke with him. He took the wheel off the cart and he caught the axle of the cart in one hand and the wheel in the other and drove on home. He used to carry out the full of a creamery can of milk to carts. He also used to carry an iron plough on one shoulder and an iron grubber on the other out to the fields. The iron plough would weigh about three and a half cwts. [?] and the iron grubber about two and a half cwts. He was a brother of Rev. Patrick Slevin P.P. who died in 1929. Joe Gallen of Meenareagh and James Gallen of Cronalaghy can cure the sprain by charm. They say some prayers and rub the sprain three times. If it is a week from the person got the sprain it will be another week before that person is better. Patrick Gallen of Lismulladuff can lead for the mumps. The cure of the mumps is: a pair of winkers is put on the person that has the mumps and is lead over a march burn. They filled a vessel called a “noggin” with oat meal and boiling soup, put salt and pepper on it mixed all together and supped it with a wooden spoon. The “noggin” was also made of wood, and I often heard people say. I have as much in my noggin as I am able to sup. By Brighid Ni Cheallaigh from her mother Mary Anne Kelly, Mullaghanery. Long, long ago when the ancient Irish dwelt in raths, a party lived in a rath at Lismulladuff where the Storeen now remains. An enemy was observed coming from the east and he people in the rath decided on going away. Taking with them their goods and money. They went in the direction of Ballybofey. Being unable to travel quickly enough they decided to hide their goods and money. They buried them in this hill and that is why it is called Cnoc an Airgid. Once Upon a time there was a man whom the people called Mc Hugh the robber. He spent most of his time on the lonely hills of Donegal, and he robbed some of the rich men who passes that way. So anyone who had money was afraid of him. At nightfall a man came and asked for lodging and the woman kept him. He would not go to bed but slept at the fire. about two o’clock a knock came to the door and the woman went to open it. She found a man with a gun standing there. He asked her for the money and stood inside the door while she went to get it. The man who was sleeping awoke at this time jumped up and caught the other. Forced his hands behind his back tied his hands and feet and left him there while he went for the guards. He took them to the house and told them he himself was the robber then he disappeared among the trees. The guards went on to the house and found the man who was tied to be their own sergeant. He was taken away and put in prison for a long time. The McHugh in the last story probably refers to Frank McHugh, also known as Proinsias Dubh (Black Frank). He was a highwayman who preyed on travellers on the roads through Counties Tyrone, Donegal, and Fermanagh. Frank was sort of a colourful Robin Hood character who, with his gang, only robbed the rich, never the poor. His career started around 1770 and lasted until he was captured around 1780. He was hanged at Enniskillen Jail in 1782 and buried in an unmarked grave in the Carn Graveyard on the road to Lough Derg. One of my characters in “Donegal Generations” is portrayed as a highwayman in a gang named for Black Frank. His life also ended poorly.